1. the approved trails in the Multi-Species Habitat Conservation Plan (MSHCP). Land located in Wildomar will be discussed. MSHCP land currently occupy a significant portion of lands east of the 15 freeway. install trail off La Estrella. Flood Control (RCFC) requiring a $5,000 deposit. budgeted for purchase and installation. 4. The Justin Hunt Memorial Trail. This is a 16 foot wide 3/4 mile long D.G trail located behind the Windstone Ranch housing development with trail heads, for staging horses located at the end of Penrose and Gruwell St. This is currently owned by Riverside County Regional Parks and Open Space as an un-maintained trail. For a full copy of the Agenda Packet one can visit the City of Wildomar Website. This entry was posted in Daily Ruminations, Future City of Wildomar and tagged Bob Cashman, Timothy Walker, Trails in Wildomar on October 23, 2015 by Kenny. There seems to be some talk of residents fed up with the scofflaws in and around school zones. 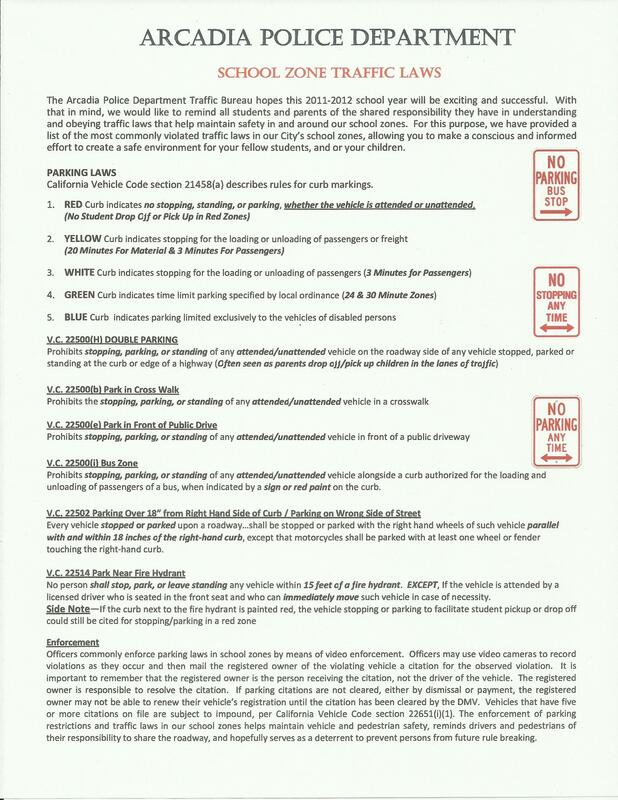 While looking at some data I came across an excellent list of School Zone Traffic Laws put out by the Arcadia Police Department Traffic Bureau for the school year 2011-2012, these laws are still applicable. Persons under 18 years of age must wear a properly fitted and fastened helmet for bicycles, skateboards, roller blades, etc. For those that wish the PDF of this flyer it can be downloaded from. This is covered under V.C.22500(e) In front of a public or private driveway, except that a bus engaged as a common carrier, schoolbus, or a taxicab may stop to load or unload passengers when authorized by local authorities pursuant to an ordinance. For some reason the Acadia P.D. Flyer left out Private Driveway. 2. 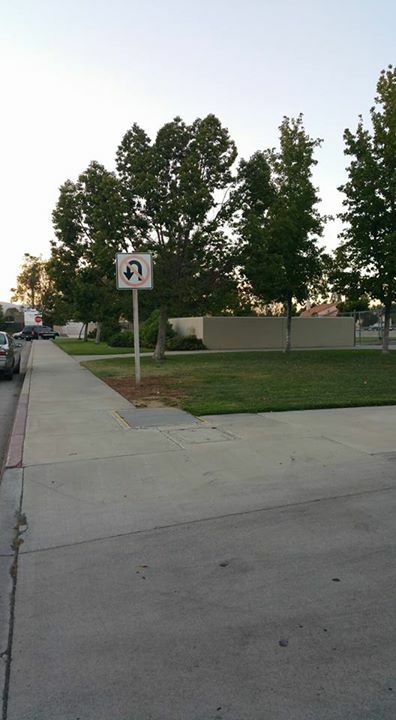 What do the U-Turn signs on Mayhall Dr. in front of William Collier Elementary School mean. ordinance, from prohibiting the making of any turning movement by any vehicle at any intersection or between any designated intersections. But, leave it to the law to open this up to interpretation. Taking a left into a driveway, backing out, and then driving in the opposite direction does not count as a U-turn. This was decided in the California Supreme Court case People v. McGuire (1978). All these laws are fine and good if law enforcement is available. Wildomar currently has approximately .40 officers per 1000 residents. The City of Arcadia has 1.14 officers per 1000 with the state average being 2.3 per 1000. If you look at Arcadia’s flyer they use video cameras to record violations as they occur and then mail out tickets to the registered owner. Not sure if only applies to parking violations. 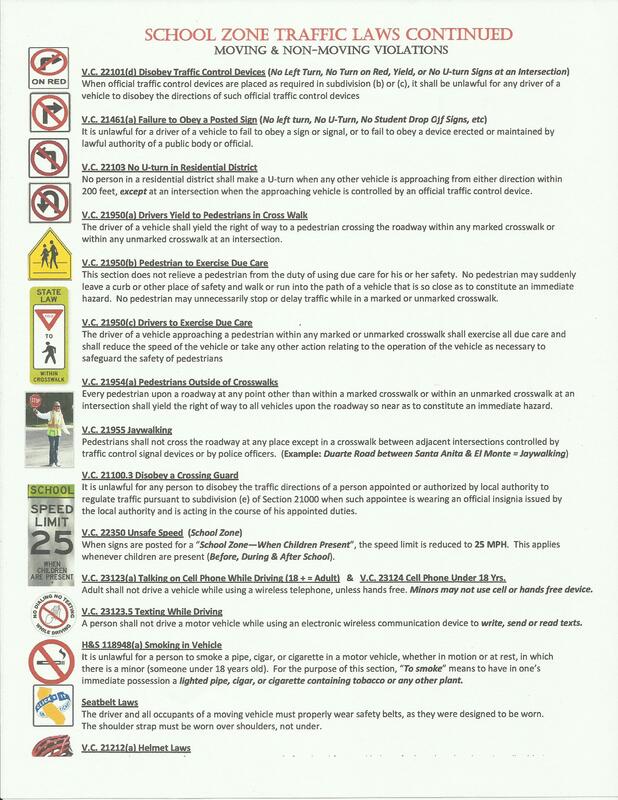 Parents can set up Walking Trains and Bike Trains using guidelines available on these sites. The County of Riverside Department of Health also has information on these types of programs at their “Injury Prevention Services” division. This entry was posted in Daily Ruminations, Future City of Wildomar and tagged Riverside County Sheriff, Wildomar City Council, Wildomar City Staff, William Collier Elementary School on October 22, 2015 by Kenny.